The RealMe planning to launch Realme Pro 3 on April in 2019. It will be the biggest Mid-range killer smartphone with high features. 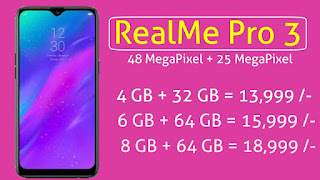 Rumors say that RealMe 3 Pro will have 48 MP Rear camera and 25 MP Front camera with two flashlights. It will be a plastic glass build design with the metal frame. 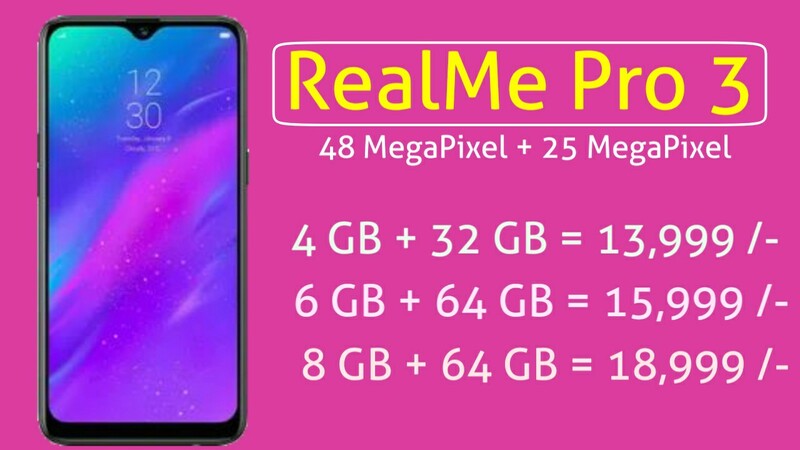 RealMe Pro 3 features 6.3-inch AMOLED display with a 1080p x 2340p pixel. You will get Gorilla glass 6 protection which means no scratches or scuffs. It will be the first smartphone from RealMe that will have a super strong display. It will support Type-C charging cable. You will see a small water drop notch on the top of the display. RealMe Pro will come with two camera setup which includes 48 MegaPixel primary camera and 16 MegaPixel ultra wide angle. You will see 25 MegaPixel selfie camera which gives you outstanding selfie photos. RealMe 3 Pro will compete with Redmi note 7 Pro in camera. It will have a 4,000 mAh battery and also support 4.0 fast charging support facilitated with Type- C port. RealMe Pro 3 will comes with Qualcomm Snapdragon 712 processor which is snappy. It will have a 4GB of RAM with 32GB of storage, 6GB of RAM with 64GB of storage and 8 GB Of RAM with 128 GB of storage. RealMe Pro 3 will base on android 9.0 pie which is the latest android version. RealMe Pro 3 expected to be launched in April on 2019.